Issue 8.8 is now online! This issue contains two Applications articles and two Open Access articles. These four papers are freely available to everyone, no subscription required. – Paco: An R package that assesses the phylogenetic congruence, or evolutionary dependence, of two groups of interacting species using both ecological interaction networks and their phylogenetic history. – Open MEE: Open Meta-analyst for Ecology and Evolution (Open MEE) addresses the need for advanced, easy-to-use software for meta-analysis and meta-regression.It offers a suite of advanced meta-analysis and meta-regression methods for synthesizing continuous and categorical data, including meta-regression with multiple covariates and their interactions, phylogenetic analyses, and simple missing data imputation. Many problems in environmental management and sustainability have no single, optimal solution. Such problems are called ‘wicked problems’. Any solution to a wicked problem will significantly affect a wide range of stakeholders, and cannot be separated from human ethics, values and social equity.In the Open Access article ‘The modelling spiral for solving ‘wicked’ environmental problems: guidance for stakeholder involvement and collaborative model development‘ Lael Parrott describes key ways in which scientists and ecological modellers can contribute to the search for solutions to wicked problems in collaboration with stakeholders. By following his recommendations ecological modellers can accomplish socially relevant research that contributes to the collective search for sustainable solutions to wicked environmental problems. 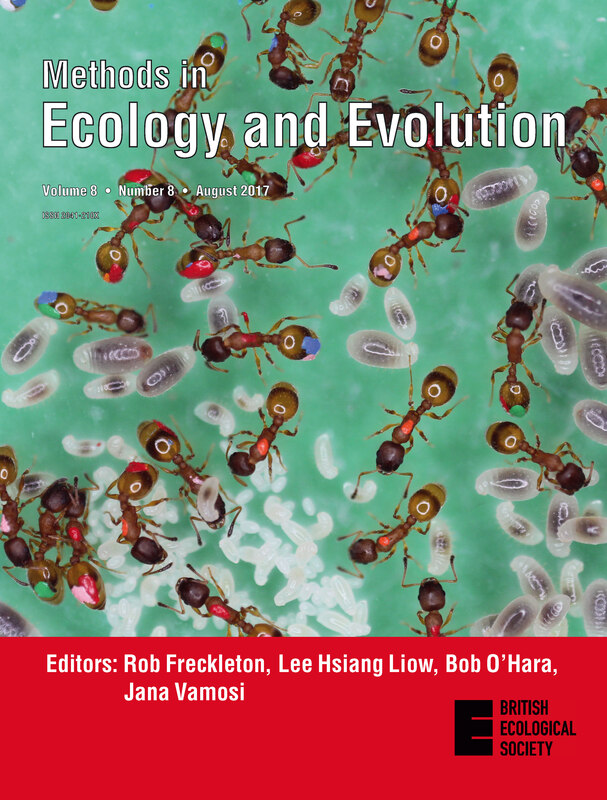 Our August issue also features articles on Evolutionary Biology, Community Ecology, Population Ecology, Monitoring and more. Animals often display a marked tendency to return to previously visited locations that contain important resources, such as water, food, or developing brood that must be provisioned. Ant colonies typically consist of different worker castes which each exhibit ﬁdelity to different sites within the nest; nurses stay inside and tend to the brood, whereas outside-nest workers forage and guard the nest entrance. This image depicts brood and workers of the rock ant Temnothorax albipennis, which displays strong site ﬁdelity. In one of this issue’s two Open Access articles – ‘Measuring site fidelity and spatial segregation within animal societies‘ – Richardson et al. identify the important sites to which individuals are attracted through statistical comparisons between the observed spatial trajectories (gathered from workers each marked with a unique combination of coloured paint dots), and null model trajectories that lack spatial biases. By quantifying the overlap between the sites visited by different workers, they construct spatial networks in which individuals are strongly connected if they frequent the same spatial locations, or weakly connected if they frequent different parts of the nest. Whilst many studies have used encounter patterns to identify sub-populations within animal groups, the spatial networks provide an alternative framework for identifying sub-groups within large societies in which individuals may visit the same places, but never make contact. This entry was posted in Journal updates and tagged community ecology, Ecological Modelling, ecology, Environmental Management, evolution, meta-analysis, Meta-Regression, monitoring, phylogenetics, Population Ecology, Rock Ant, Site Fidelity, Sustainability by Chris Grieves. Bookmark the permalink.